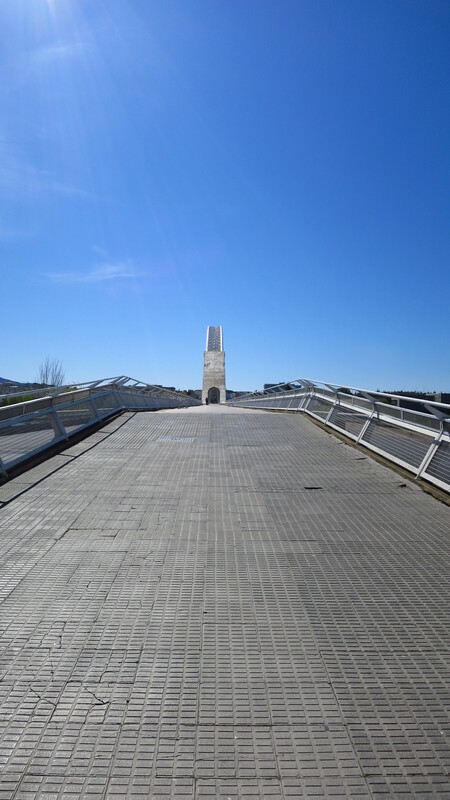 When planning the route across Spain I wanted to visit the area south of Madrid, as I had already been north of it several times on the bike and I wanted to see something new. Out of Toledo I could either take the motorway, be done with the riding in a couple of hours and spend the rest of the day visiting Mérida or head south-west and take the roads through Cijara natural reserve, which looked a much more appealing prospect than having to endure more motorway miles; however, that meant that if I still wanted to have time to see Merida I had to get up really early. The alarm clock went off at 7 am and ten minutes later I was already dragging my bags to the bike, which was park a couple of streets away, in a small square reserved for residents only. It was still dark and the streets were deserted, in sharp contrast to the previous evening, when hundreds and hundreds of people had lined these same streets to see the processions. The only other people up so early on a Monday morning were the cleaning crews, hosing the cobbled streets to wash the litter away. They patiently waited for me to load the bike before cleaning that last spot on the square, and then I was out of the city in the dim light of dawn, riding carefully on the wet steep streets and looking forward to a nice morning ride. The sun came out as I was turning off the main road and into the Montes de Toledo, I opened my visor and took in the smells of the forest in the morning as I rode up a perfect road in zero traffic. The perfect road did not last long, however… I had started riding on the CM 4157, but the good tarmac went on to become the CR 701 and my CM 4157 became barely a paved forest road which apparently had no traffic other than logging trucks, so no wonder it was more a collection of patches and badly repair potholes than tarmac. Even at a moderate speed the bucking and vibrations were quite annoying, so I had to take things very easy and enjoy the landscape. I was having a great time maybe halfway between the point where the road had turned away from the main route and the Cijara reservoir when I heard a clanging sound coming from the back of the bike. I slowed down and the sound died away, but the moment I sped up and the bike started shaking on the bad road the metallic sound was back. I did not feel anything strange on the handlebars or though my bum, so I assumed that something had come loose in the panniers. I stopped to check, trying to find what was vibrating, but could not figure it out. I had determined that the sound was coming from the left side of the back of the bike, maybe under the pannier, maybe behind it, but I could not see anything wrong there. The jerrycan was still firmly attached and made no sound when I tried to rattle it with my hand, and so were the water bottles at the front, the mounting frame for the pannier, the passenger footpeg, the lid, the padlocks, and the duffelbag attached to the lid. I rode on, and the sound appeared again as soon as I gathered a bit of speed. It sounded like I was dragging an empty can behind me, and the whole was starting to annoy me. I was in the middle of nowhere, with zero cell signal and I had only seen one other vehicle on that route, the logging truck… I did not feel like spending the whole morning there waiting for somebody to drive by. I stopped again and checked the sidestand and centerstand, without any luck either. Then, as I crouched down to check the chain, I saw it. With all the vibrations one of the bolts that hold the chain guard to the swingarm had fallen off and the chain guard was rattling against its mounting point. It is a part that is made mostly of plastic (I have the standard one) but it has metal plate on the back mounting, which was making the mysterious sound. I tried to fasten it with a zip tie, but I was afraid the vibration would quickly break it, so I just took the whole thing off and strapped it on top of one of the duffel bags until I got to a town where I could find a bolt. Much more relieved, I went on my way, enjoying the beauty of the park. I noticed that there were signs that read “natural reserve” every few kilometres, but to my surprise there were also a lot of signs indicating the limits of private hunting land, and some ways down the road I saw a lot of cut down trees and some logging equipment, presumably that was where the truck I had seen earlier came from. Hunting and logging seemed a peculiar way of protecting life in a natural reserve… well, Spain is a peculiar country, I guess. 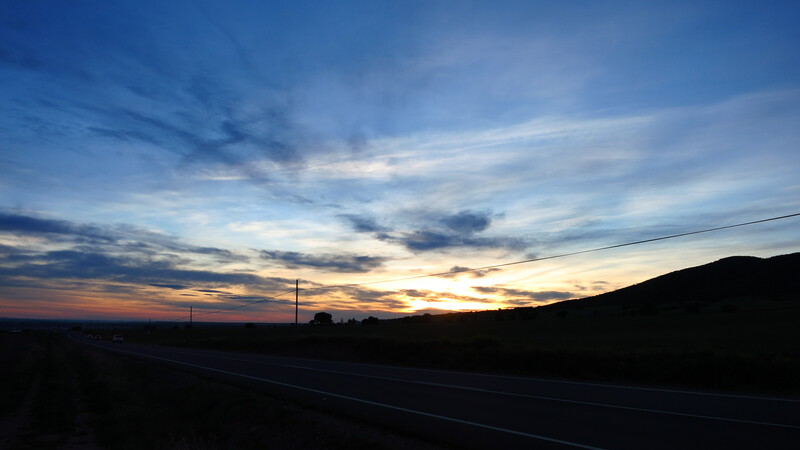 I was now in Extremadura, and after turning into an even smaller road around Cijar reservoir another flashback from Kazakhstan came to visit – first it had been the bolt loosening vibrations, and now it was the unexpected-ten-inch-deep-with-jagged-edges pothole. Not wishing to break a rim again, I slowed down to almost walking pace and played the avoid-the-pothole videogame for a while. 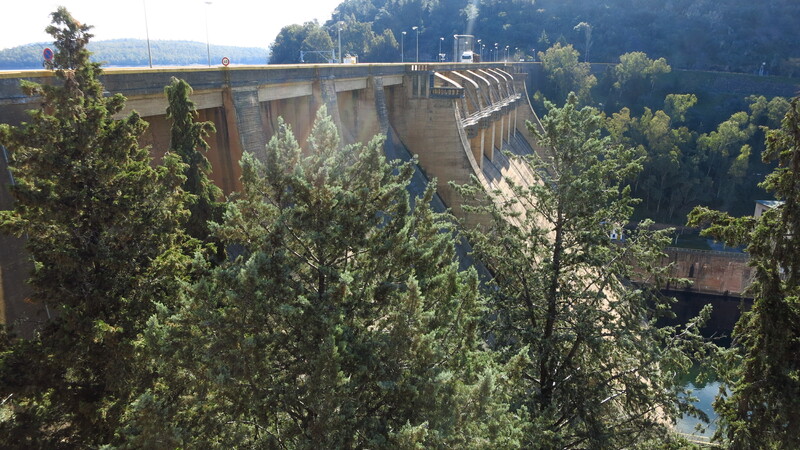 The bad road ended near the village of Helechosa, and from then on the road that took me to the dam was marvellous. 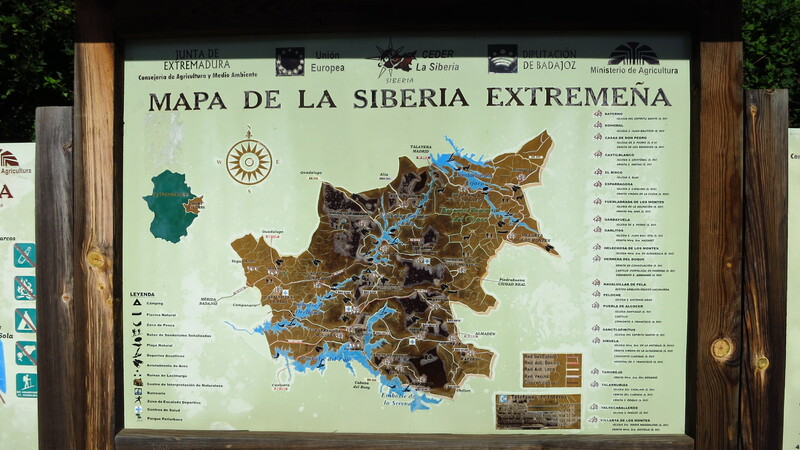 I stopped there to take a few pictures of the dam before joining the main road for the last stretch to Mérida, and was surprised to see a sign announcing that I was in the Siberia Extremeña. I got to Merida by lunchtime and checked in at the hostel I had booked. It was just 15 minutes away from the historical city centre, I had a nice room with bathroom all to myself and they had free underground parking space for my motorbike. Nice! 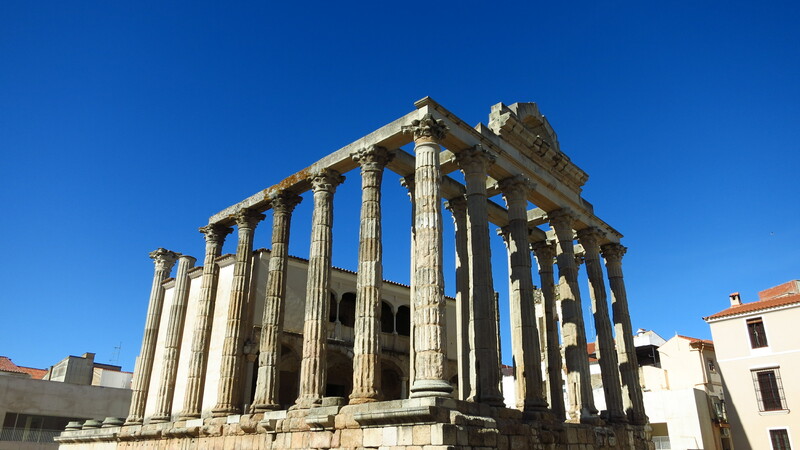 Merida’s roman ruins are amazing, and despite the stifling heat I was determined to see as much as I could before sunset, so I got started right after having some tapas for lunch in the main square. 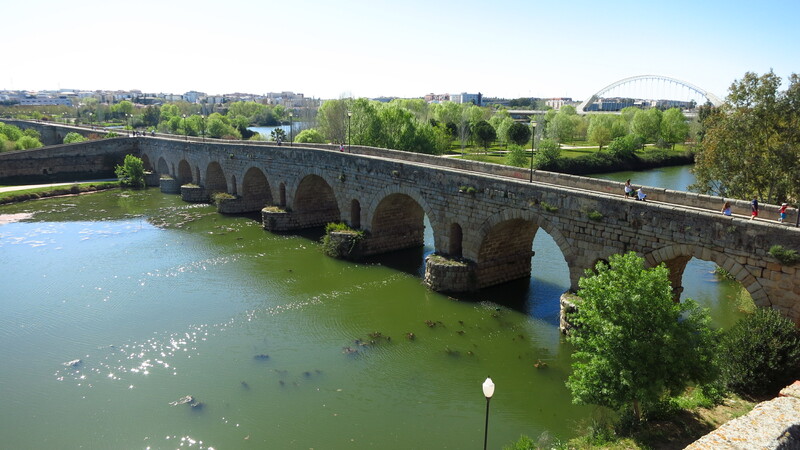 I went down to the river and crossed it using the new bridge to have a good view of the old roman bridge and take some pictures, but it was probably not a very good idea… it was 4 pm, the bridge was quite long and there was not a shade in sight. Needless to say, I was the only fool walking across at that hour. The walk back across the roman bridge took me to the Alcazaba where you can buy a ticket that grants access to all monuments in the city for only 12€, and should you not have time to see them all, the ticket has no expiry date, so you can come back any time in the future and see the rest. I started my sightseeing tour in that 9th century fortress, and spent a bit longer than needed visiting the aljibe, an underground cistern that collected water from the river where the temperature was a lot nicer than outside. From there I went to the main sights of the city, the amphitheatre and the Roman theatre, but not before visiting the forum and the temple of Diana on my way there. 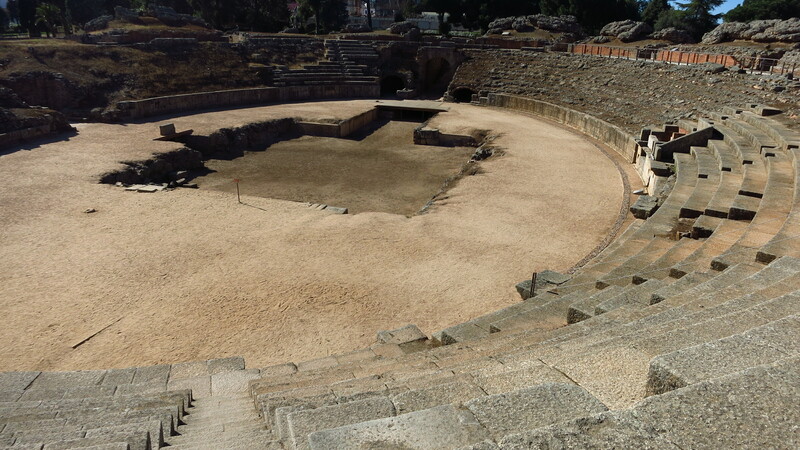 The amphitheatre and the Roman theatre are two of the best preserved buildings from that period and a good example of how the Romans understood the importance of keeping the population entertained. Walking down the stands and looking and the imposing stage it was easy to imagine the place full of citizens, seated in different sections according to their social class, enjoying the plays. It was getting late, but it was still quite hot. Time for the last visit before heading back to the centre for some more tapas and beer. 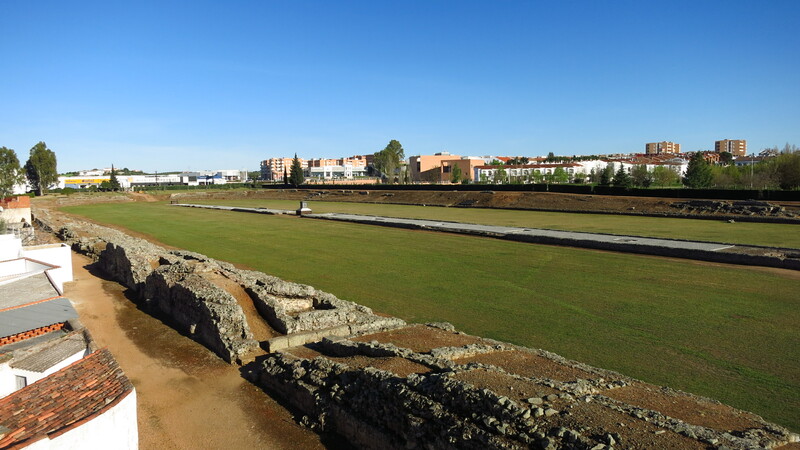 I had left the Circus Maximus until the end because I knew that at 400 metres long and 30 wide I would not enjoy walking up and down under the sun on the same sand where Diocles obtained many of his 1,462 victories. 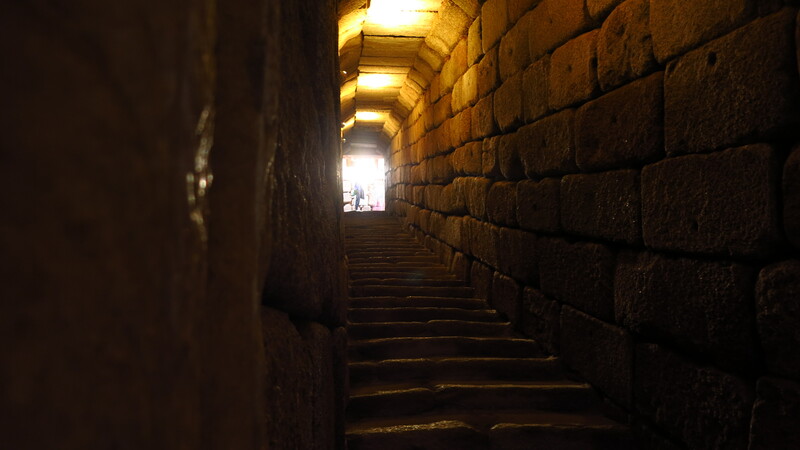 When I was done with the visit I realized it was still early for dinner, so I decided to make the most of my ticket and finish the tour with a visit of the crypt of Santa Eulalia. With the sun finally low, I found a nice table at a bar in a sidestreet and enjoyed some well-deserved beers before ordering a few more tapas and heading back to the hostel. 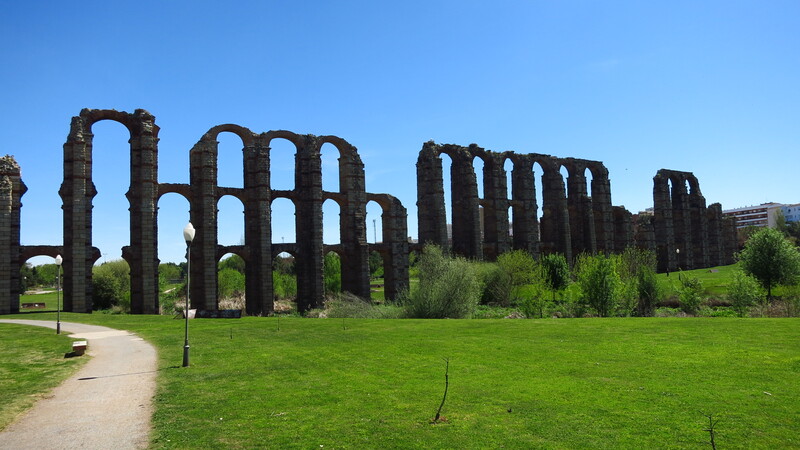 One more sight waited for me on the walk back, though – the aqueduct, standing tall across the small river just outside the old centre. 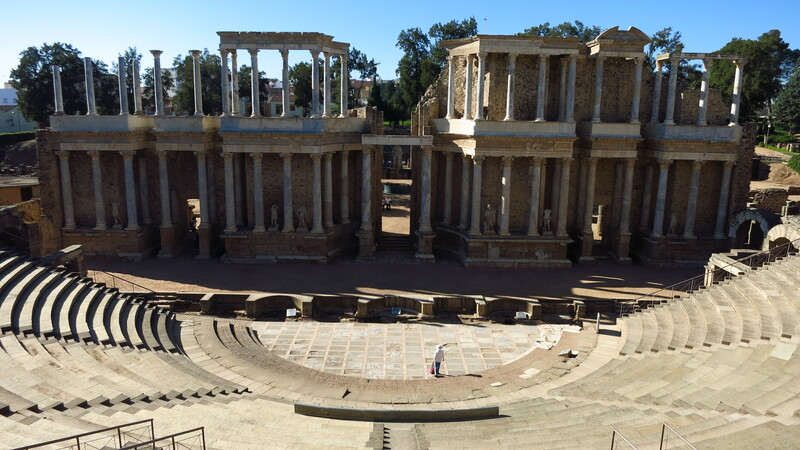 This entry was posted in Portugal and Southern Spain 2015, Travel and tagged Merida, Toledo by Kilian. Bookmark the permalink.